The two new semi-open MRI scanners (MRI) at Conradia Radiologie München (ex. Diagnostik München) are particularly well-suited to patients with claustrophobia. Siemens Aera MRTI-equipment offers patients more space thanks to its internal diameter of 70cm and a cylinder length of just 125cm. Patients with claustrophobia no longer need to worry about feeling confined. It is possible for you to bend your legs. Moreover, most scans can be performed feet-first. This means that your head can remain outside the Siemens Aera MRIscanner. Even if it is necessary to place your head inside the cylinder during the MRI scan, the usual clicking sounds can be reduced to a minimum thanks to the “Whisper Mode”. 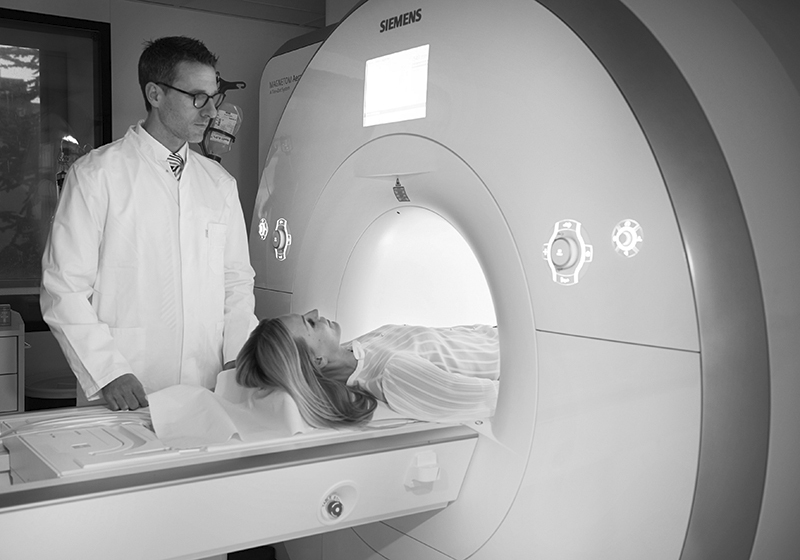 The new, semi-open Siemens Aera MRI equipment is extremely powerful thanks to a 1.5 Tesla magnet and offers seven times the image resolution of previous, open, “sandwich” MRI machines. During the examination music can be provided, if desired. Various lighting effects also contribute to a sense of comfort. In addition to the three scanners at the Augustenstrasse branch (Philips Ingenia 3 Tesla, 2x Siemens Aera MRI 1.5 Tesla), we have also been operating a state-of-the-art 3 Tesla Siemens Skyra MRI since December 2017 at our urology clinic in Planegg. This is, to date, the best imaging for prostate MRI available on the market. In addition, we also operate a 1.5 Tesla MRI at the Schongau branch of the clinic and will have one at the Perlach branch in future.